Our cabins feature easy access to the Ohio River and a dock on the water. All of our cabins have private hot tubs, outdoor fire pits and gas grills with propane provided. They are a perfect place to bring your family or just enjoy a little quiet time alone. 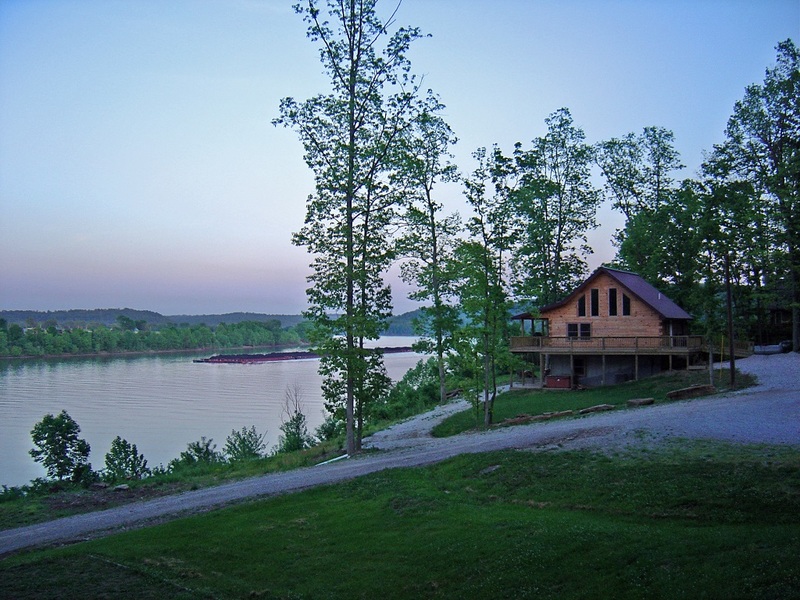 Watch the sun and moon rise over the Kentucky hills and light up the Ohio River from the comfort of your cabin. Vinnie’s Ohio River Cabins are located in Magnet and Derby, Indiana on the beautiful banks of the mighty Ohio River. Indulge in one of the many recreational opportunities such as fishing or boating on the Ohio River, eating good food at local establishments, hiking in the Hoosier National Forest, visiting local attractions or just relaxing. Each cabin has a hot tub. There is a one time $40 fee for the use of the hot tub. We ask for a two (2) night minimum at all times on all cabins. A one night stay is available with an extra cleaning charge. Pets are allowed in some cabins with an extra charge depending on breed and size of dog. Absolutely NO SMOKING is allowed in any of our cabins. Day Guest Rates Visitors to your cabin that do not spend the night are charged $7.00 each. Call for special Group Party rates. Security Deposit A $150 security deposit is required at check-in. Reservations & Payment Reservations require a 50% deposit and are payable via check, money order, cash, Visa or Mastercard. No checks will be accepted the day of arrival. Cancellations For cancellations, your deposit will be refunded with a 60 day notice minus a $100 cancellation fee. Taxes Perry County Innkeepers tax of 5% and Indiana State Sales tax of 7% is added to the total. This is not our tax. We collect it and pass it on to the government. NOTICE: During certain times of the year, the Ohio River can be high and our docks may be under water. We absolutely cannot control this. Thanks for understanding.